Following a recent major fire in a Durban warehouse, we deem it necessary to discuss ways in which warehouses need to be protected against fire so that a fire can be detected early and contained before it gets out of hand. As was experienced in Durban, fires emanating in a warehouse can cause a lot of damage if not contained at an early stage. There is also the environmental pollution that occurs to the surrounding areas due to the large amount of smoke which in a many of cases can be toxic. 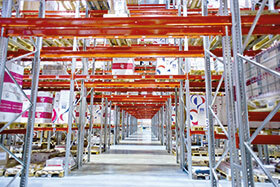 Installing a compliant and functional fire detection system for a warehouse requires proper and thorough planning. The size of the warehouse, activities within the warehouse, being manned or unmanned and available funds will be the major items that will determine what type of system gets to be installed. Water sprinklers, hydrants and fire extinguishers play a key role in initial fire fighting and are a requirement in nearly all cases, but our key focus is early detection that will enable the exact location of fire to be detected and measures taken to extinguish or contain the fire at an early stage. The designer of the fire detection system will need to take into consideration the layout of the warehouse and activities that will be happening there during normal working and even after hours. It defeats the purpose to install smoke detectors in a production warehouse where there are fumes or dust produced in fairly large quantities during normal operation, as false alarms will keep occurring. One must consider the servicing of smoke detectors in heights more than 10 metres, this will require scaffolding or a cherry picker and it may not even be possible to access the smoke detectors in some areas of the warehouse if there are machines or racks that will be installed after installation of the smoke detectors. Point type smoke detectors cannot be installed in heights of more than 10.5 metres. Some warehouses have openings at the roof sides which allow for natural ventilation and light, some have smoke vents at the roof peak; consideration needs to be taken to ensure that dust and rain will not get into the detection devices installed at roof level. The probability of stratification of smoke needs to be taken into consideration when siting smoke detectors or any other detectors on the roof. Stratification occurs in summer when the sun heats the roof sheeting and creates a hot air layer at roof level within the warehouse. During a fire condition, if the hot air layer temperature is greater than the smoke when it reaches this point, the smoke will not be able to penetrate the heat layer and therefore detectors may not function or in the very least the alarm will be seriously delayed. It has already been mentioned that standard point type detectors cannot be installed above 10,5 metres, which leaves the fire detection designer only two choices, beam type smoke detectors or aspiration detectors. Beam detectors are generally well suited for large warehouses due to the flexibility they have in providing coverage for over large areas and heights up to 25 metres. Beam detectors are easily accessible and easier to service than smoke detectors as there will be fewer in number in comparison to smoke detectors and the control unit will usually be installed on the wall of a warehouse as compared to smoke detectors which have to be spread on the entire roof. Beam detectors need a clear line of sight in order to operate optimally and cannot be installed more than 600 mm from the top of the roof. This is a trap many fire detection companies fall into as in today's roof type structures it is not easy to achieve these two parameters and they end up installing beam detectors further away from the roof and taking a risk that the smoke does not bypass these detectors on the way to the roof. Beam detectors will also not operate correctly if installed on structures that are prone to movement. Most warehouses are built with iron girders and corrugated iron sheet which expands and contracts as the temperature varies. Installing beam detectors on such structures will affect the operation of a beam detector when the line of sight is lost between the transmitter and receiver. Aspiration beam smoke detectors is the second option to consider. The ASD (aspirating smoke detector) operates by actively sampling air from a protected area via multiple sampling holes in a pipe network. The air sampled is then transported to the aspirating control panel to detect the presence of smoke. An ASD provides many programmable levels of smoke detection, from a very high sensitivity through to low sensitivity as required. An ASD is approximately 100 times more sensitive than a point smoke detector and it can even detect smoke that is not yet visible to the naked eye. The ASD is not affected by the roof structure, does not require line of sight and provides better coverage than the beam detector. Although the initial installed cost of an ASD may be higher than smoke or beam detectors, the ongoing maintenance costs are greatly reduced as the control equipment and filters that require maintenance are installed at eye level and there is no need for high lifting equipment. A quick, automated response to an actual fire alarm can assist in the saving of lives and lessening the extent of damage to property.